PART OF THE REVITALISATION OF THE BRITOMART PRECINCT, THIS HIGH PROFILE, STATE-OF-THE-ART PARKING BUILDING WAS AN ESSENTIAL PART OF THE LOCAL MASTER PLAN AND BECAME A VIBRANT COMMERCIAL CENTRE IN ITS OWN RIGHT. The Britomart precinct is dominated by upgraded heritage buildings and new commercial offices that have no parking facilities. The resource consent conditions for developments in the area specified that an adequate carpark facility be provided nearby. Cooper and Company had purchased the Britomart Carpark site in 2004, with the intention of developing a facility that would meet the growing need for parking, while enabling it to be kept out of the heritage precinct itself. 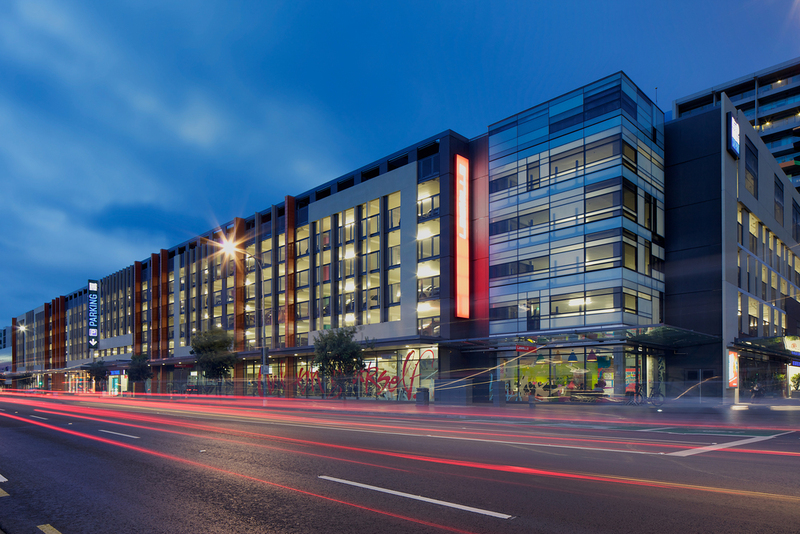 With high demand for parking in the area, the building needed to provide in excess of 1,200 carparks for nearby office tenants, as well as 400 public carparks and an up-market valet parking service. At street level, the building would offer 3,000sqm of street-level retail and space for other business activities. Ignite was engaged to prepare the master plan, concept and preliminary design in order to achieve resource consent. This phase of the project required substantial dealings with Auckland Council Planners, urban designers and officers to obtain the resource consent at a notified hearing. Once resource consent was granted, Ignite completed the developed design and documentation, and worked closely with the contractor, as principal consultant, to deliver the project. Cooper and Company was eager to develop a facility that was easy-to-use, pleasant to be in and a vibrant commercial centre in its own right. User experience was paramount and the client wanted a building where anyone would feel safe at 3AM. This approach gave the design team the opportunity to step back from the traditional approach to carpark buildings, which treats them as an afterthought to the construction of a commercial complex. Increased lighting levels, a fully-painted finish on all ceilings, walls and columns, and high quality finishes in the main public areas create a pleasant environment. A fully-integrated carpark ticketing and management system, along with an integrated security system, ensures a safe and efficient experience for users. While the desire to create a generous, user-friendly space was strong, the need to fit more than 1,600 carparks within a 6,557sqm site – with a maximum building height of 17 metres and no possibility of below-ground parking – meant efficient use of space was critical. To make best use of the site within its height restriction, the design specified a floor-to-floor height of 2.55m, using post-tensioned slab technology that created a totally flat slab soffit. This allowed the client to maximise the number of floors and carpark yield, while providing a clear ceiling height of 2.3m and generous parking bays. The ability to further develop the site in future was another key aspect of the brief. Ignite’s design incorporates provisions for a footbridge link across Quay St, and allows for some areas of the building to be converted into apartments if desired.